LUCY BURDETTE: Have you ever had a fabulous meal--or even a bad one--and wondered who was the chef behind the dinner? And why he was doing what he was doing? And then what kind of personality leads you to choose a career that involves long hours, heavy physical work, rampant competition, and a big ego? Psychologist Scott Haas had all these questions and more--and then spent eighteen months interviewing the staff and chef at the restaurant CRAIGIE ON MAIN in Boston. And he's visiting JRW today to talk about that process and his new book: BACK OF THE HOUSE--THE SECRET LIFE OF A RESTAURANT. Welcome Scott! Will you start by telling us a little about how you got the idea for the project? How much did the book change from its original concept? SCOTT HAAS: Thanks so much for the invitation to talk about my work, Lucy. I’ve been passionate about writing about the psychology of chefs for decades: In Kitchen Confidential, Anthony Bourdain showed us what goes on in restaurant kitchens; Back of the House shows us why. Who in their right mind cooks for strangers, night after night, 18 hour days, for years on end? These are unique, ironically functional individuals who don’t fit into 9-5 lives and somehow find a home in the dark recesses of kitchens. Bandits! Historically, restaurants have always been homes for social outcasts and those who live in the the demi-monde. I’m attracted to that darkness. Did my concept for the book change? Not really: Intimate start to finish. LUCY BURDETTE: In your book, you talk about how most chefs have a history with food and with cooking from a young age that explains the direction they take. What was your food history like? SCOTT HAAS: My dad, who was born and raised until a teenager in Bavaria, was always telling my sister and me about how much better the bread, butter, cheese, beer, and so on were in Germany so I grew up wondering about things I had not tasted: Food was something I imagined. I grew up wondering how things might taste, and not how they tasted. My mom, not permitted to cook with spices, garlic, and onions for my father who, as a central European, preferred meat driven dishes like roasted duck, braised beef, and sauteed veal led me to appreciate eating out. Restaurants became a place where as kids we could try dishes that were not allowed in our kitchen at home that had been “cleansed” of deep flavors. As an adult, after my wife and I had our son and daughter, I took cooking, which I’d done since an early teen, more seriously, and worked on every recipe from Marcella Hazan’s three cookbooks several times each, read Finnegan and Johnson on wine, and wound up working in restaurants--those of Gordon Hamersley and Silvano Marchetto. I co-wrote Silvano’s cookbook about his famous celebrity restaurant in New York City’s West Village: Da Silvano. And now, as a clinical psychologist, I realize that food is such a great relief from stress, sort of like a solo from Sonny Greer or Miles on “So What?” A nonverbal refuge. LUCY BURDETTE: I know folks would like to hear a little about what you did in the kitchen at Craigie for 18 months. Did you end up feeling like you had an effect on the staff there? Did you ever feel like you had become a psychologist to the chef or the staff? SCOTT HAAS: Initially, I listened and developed trust. Then I did a lot of prep. I don’t have the speed or hand-eye skill of a line cook in his or her twenties; frankly, it’s factory work and the complete opposite of being creative. I don’t think I had much effect on the cooks, no; these are very young people who are for the most part utterly undecided about what to do with their lives. I was a stranger passing through town. With the principal chef I wrote about, for sure I became a person he talked to about difficulties; but there is a profound superficiality to the way some chefs regard the depth of their emotional lives--an avoidance, a a calcification, part of why they cook instead of developing intimacy. Cooking is much easier than working on relationships. Certainly the chef told me extremely personal things, but this is not an introspective profession. On the contrary. LUCY BURDETTE: Toward the end of your time at Craigie, you decided to take a turn working for several of the sous-chefs. What was that like? And what was it like cooking for all of them? SCOTT HAAS: I was humbled. Like being George Plimpton in a football huddle. LUCY BURDETTE: Tell us about your favorite meal ever at Craigie. 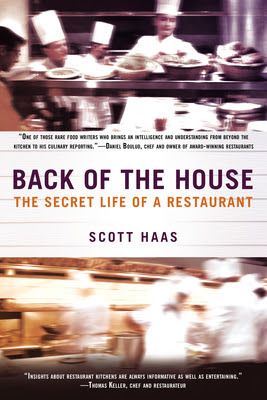 SCOTT HAAS: It’s not just about the food, and I never ate at the restaurant before I started the book, enjoyed about four meals there while writing the book, and have not been back since finishing the book. I love Japanese, Italian, and Italian-American food, chiefly vegetarian or fish; that is not this restaurant where pork and offal take pride of place. I’m more fascinated by the chef at Craigie’s desire to make the food an expression of his identity than how his food tastes. I do like his roasted chicken; it’s pretty good at $60 for two. But the real story here is: "The milk’s in me, and I’m in the milk," as Sendak wrote. I met a chef whose food in many strange ways is inseparable from his sense of who he is as a person. It was the most unique restaurant kitchen I’ve ever been in: A kitchen about the chef, not the food. And click here for a fascinating video of Scott talking about the chef he studied, Tony Maws. LUCY: JRW, Scott will stopping in today to answer your questions. We also have an ARC of THE BACK OF THE HOUSE to give away, so please a comment and you'll be entered in that drawing. This sounds like quite an experience . . . it surprises me, though, that the kitchen was “about the chef, not the food.” I would have thought the opposite --- that the chef would be focused in large part on the food and would see the food as a creative expression of his talent as a chef . . . .
Craigie's, Hamersley's -- add Hungry Mother and Oleana and you've got my quartet of all-time favorite restaurants in Boston. I'll definitely be checking out your book. Did working in a restaurant take any of the fun out of eating for you? I will look for this book. We have a chef in the family, but he is the funniest and most family oriented Dad I know!!! I'll echo Hallie, because "fascinating," was the word that came to mind. I'll look for your book Scott. Thanks to the Reds for another interesting author and book! Scott, I can't wait to read your book. I've been fascinated by chefs for years. It's such a hard life--terrible hours, physically brutal--and many times I've wondered what drives people to choose cooking as a career. Scott, your book sounds fascinating. Like Joan, I'm surprised that the kitchen was "about the chef, not the food." I know a few chefs, and I know chefs usually have big egos, but I would think with a good chef the kitchen would be about the food as an expression of the chef. A hard life, for sure. I have two friends who went to culinary school and worked as chefs for quite a while and have now gone to other fields because the physical demands were just so crazy. I'm with Debs and Hallie. Just cooking for a crowd at home can be too much. Ooh, goodie! I've been waiting for this book since your first appearance on JRW, last year. Like others here, I love to cook -- and eat -- but I've been watching restaurants with a different eye since starting to write a foodie series, with a lot of chefs as secondary characters! What I wonder is whether that intensity you mention, and that Anthony Bourdain describes, is universal, or more typical of east coast restaurants. The few chefs I know out here (in MT) seem more relaxed and social than you describe, but of course, I'm looking from the outside in. Like Hallie, I'd love to hear how your experience changed eating out for you. I know two professional chefs, one a classmate from high school, the other at Zuzu at the Valley Ho. I've spent more time chatting about the food industry with my classmate, Mark, but Chef Sean Currid voiced many of the same comments I heard from Mark. Both expressed the common thread of loving food from an early age and enjoying the taste and textures of ingredients as much as the creativity of being a chef. I enjoy cooking, experimenting with dishes, and having someone tell me how much they enjoy the food. I'm sure that I could never have worked at it professionally--as Scott mentioned, too many long hours standing in hot kitchens. Makes my back hurt just thinking about it. Rather funny, I know, considering I spent 35 years as a nurse. I wish I had thought of writing this book. After spending years in and out of the food biz (it's an addiction that doesn't let go),I know this will be terrific reading and an eye opener for for many. Kitchens are very interesting and surprising worlds. The restaurant being about the chef was what made the experience so unique. His personal focus informed the cooking to an unusual degree. I've worked in other restaurants--Hamersley's and Da Silvano, both as writing projects; I co-wrote Silvano's cookbook--and have been in numerous kitchens all over. It adds to the fun to go backstage. I agree with you, Leslie: there are three NYC chapters about socially mature, businesslike chefs. No reason a kitchen has to be emotionally driven. Hallie, You might enjoy Market & Yakitori Zai. Was it Tolstoy who said: The story of every happy chef is the same; the story of each unhappy chef is different." Or was that Escoffier? My sister is a chef, trained in the south of France--and she talked about the incredible competition--she has burns all over her hands. She laughed, once, when I asked something about "at what temperature..?" --she said--turn on the heat, cook it til its right. ANd she doesn't let anyone touch her knives. She takes one bite of everything..that's all. I guess that needs to be my strategy, Hank. Just take one bite of everything. After a year of that, I might be as thin as you. But never as gorgeous! Exactly, Hank: No recipes, no temps, no timers in the restaurants: It's like any relationship. Here the cooks have relationships to the food. They know when it's ready. They know when it's done. Good morning, Scott! I look forward to reading your book. We love to eat out at different restaurants, and I am a critic! I have no business criticizing as I do not cook!! My niece is a chef at Fenway Park and she loves to cook. We love to have family get togethers when she is cooking for us!!! A real talent!!! I have often wondered what it is like working "at the back of the house" in a restaurant. Who and how do all those meals get prepared properly and placed in front of you/us? I hope you will send me a copy of your book!! I bet it will be a NYT best seller in no time!!! How New Is TOO New? I Wish I Could UN-See That Movie! Reality Knocks, But Are We Answering? Walking Abbey or Downton Dead? "Oh, Kaye!" has a novel coming out!